If you’ve lived in Switzerland for any amount of time, you’ve probably been to your fair share of Apéros. The Swiss like any excuse to hold one of these cheese and wine fuelled gatherings—wedding, birthday, or simply Feierabend (the end of the working day). There is no event too small to accommodate an Apéro. You’ve graduated? Apéro. A co-worker departs? We’ll miss you! Let’s Apéro. You move to a new Geminde? Welcome! (with Apéro). Dinner party? Start with an Apéro. You bought some nice Amigne? Apéro. The entire month of December? Apéro upon Apéro. At the most basic Apéro there are glasses of cold white wine, and little bowls of Paprika chips and peanuts to nibble on. More often it involves cheese, with little cubes of Sbrinz and rosettes of Tete de Moine, and dried meats like Bündnerfleisch or Mostbröckli, accompanied by long braids of Zopf. The most impressive, and filling, are Apéro Riche, where all manner of hors d’oeuvres are served, warm dishes too, and perfect for when the party coincides with a mealtime. Here’s a classic you can serve at your next Apéro—Switzerland’s beloved Schinkengipfeli. It’s ham croissants, people, and they are flaky on the outside and savoury on the inside. Recipes abound: Betty Bossi, Migusto, Tip Topf. You can make them big or small, and I always try to stuff in as much filling as humanly possible. Lots of recipes go without lemon and mustard, two things I think are essential, and I prefer to leave out the parsley. And you don’t really need to wait for an Apéro occasion to make them, they also make a delicious quick dinner, paired with a salad. In a large measuring cup, mix together the Quark, ham, onion, garlic, seasonings, mustard, and lemon. 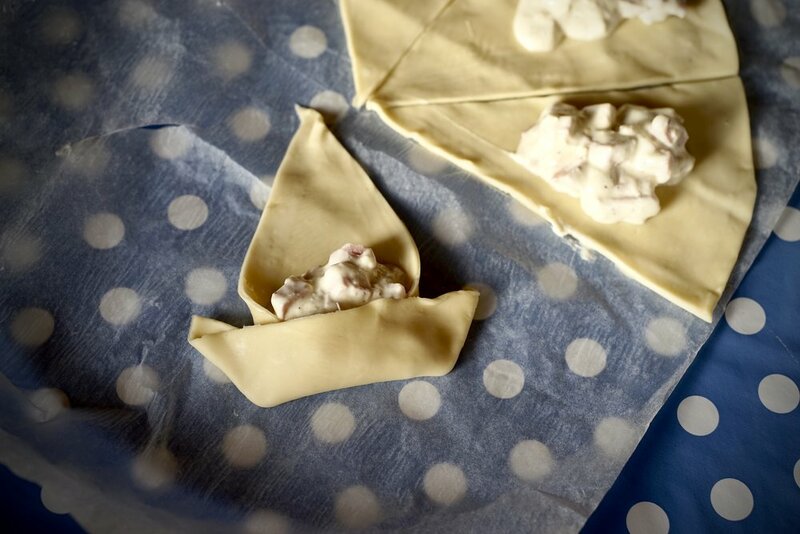 Roll out your puff pastry into a circle. Slice into eight wedges. Add the filling to the middle of the wedge. Brush all around it with egg white, then roll it up. Place on a parchment lined baking sheet, then brush with the egg yolk. 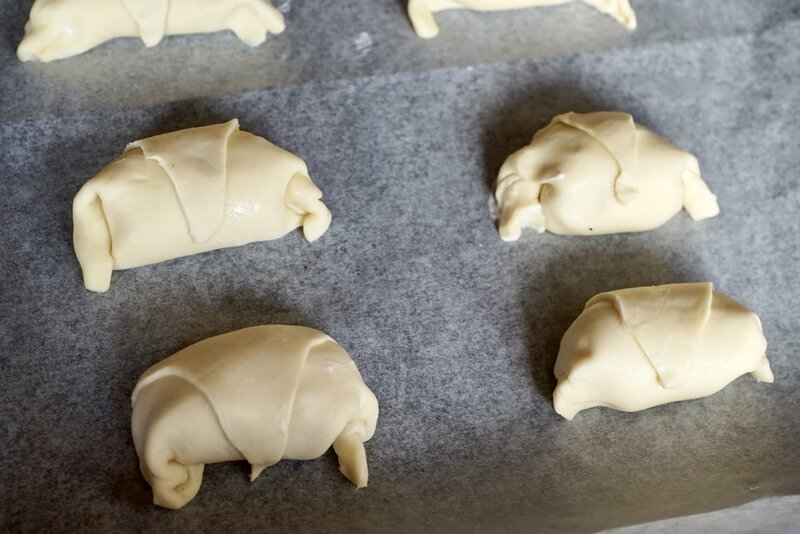 Bake for about 20-25 minutes, or until the pastry has puffed and the outside is golden. Use full fat quark (Rahmquark) for best results. If you don’t have Quark, use sour cream. More info on Quark here.